Have you ever taken the Love Language test? It is a quick 10 minute exercise, which will help you understand not only how you communicate, but it gives your partner insight into how to communicate with you. Whether you are in a relationship or single, you should take this. Click here for the test. 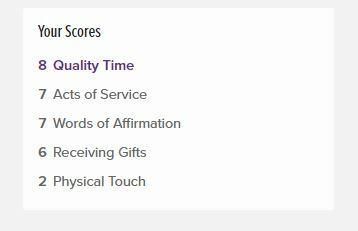 Acts of Service, Quality Time, and Words of Affirmation are tied, which means I am just very demanding. Just kidding, but it does mean that it does take a lot of work to make sure to communicate with someone like me correctly.